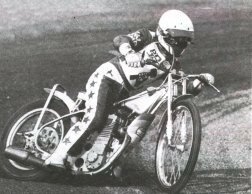 Local rider, Mark Robinson progressed to the Heathens First VII from the ranks of the British Junior League at the start of the 90s. Having made one appearance in 1989, scoring two points against Oxford, he was promoted for the 1990 season to the reserve position full-time. He completed the season at Dudley Wood with a creditable total of more than 60 points from around 40 appearances. However, he was then left out of the line-up for the following season with the return of Wayne Garratt to the ranks. Within a month, Robbo was back - but for one day only! Replacing the injured Greg Hancock against Coventry on Easter Monday, he soared to a memorable seven points in the number two berth. It wasn't enough to retain a permanent regular team place until the summer when Garratt picked up a ban for his on-track fist-fight with Neil Collins. Robinson stepped in for 9 matches while an appeal was fought to bring Bodger back, with the reverse change eventually taking place in August. 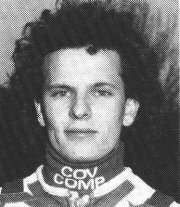 1991 ended with a loan spell at Coventry before heading back to Cradley in '92 to start the season. It was to be Mark's final spell however and at the end of April, after a string of low scores, he announced his retirement. The final straw was a back injury sustained at Bradford on the 2nd May, which proved to be his last senior appearance for the Heathens. Robbo remains a great friend of the club, being a local lad he can usually be found at all the HSSC functions and events along with Alan Grahame. He also runs his Limousine business along with ex Cradley rider Anthony Boyd.